Implementation of biometric attendance In the state 2018 .Certain Instructions -Orders Reg. ,Rc152 Dt.4/7/18. Sub: IT CELLE-HazarImplementation of biometric attendance In the state 2018 .Certain Instructions -Orders Reg. Teachers across the state. Honourable Chief Minister of Andhra Pradesh has instructed to make the attendance 100;. across the state it is proposed to obtain the biometric attendance through offline for the school havenlng no network. 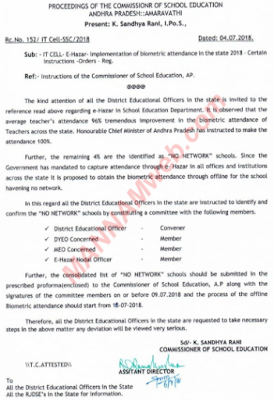 In this regard all the District Educational Officers in the state are Instructed to Identify and confirm the ”N0 NETWORK” schools by constituting a committee with the following members. signatures of the committee members on or before 09.07.1018 and the process of the offline Biometric attendance should start from 10-01-2018. Therefore. all the District Educational Officers in the state are requested to take necessary steps in the above matter any deviation will be viewed very serious.